Easy is good. Easy is convenient. It’s easy to order take-out. It’s easy to go through the drive-thru. That’s easy to put together. It’s easy on the business owner. It’s easy to run a poor radio ad, too. Take any advertising media (web, billboard, TV, etc. )… it’s easy to create ads that don’t work for a local advertiser. I’d rather you NOT take the easy road when it comes to advertising. Well, it CAN be easy as long as you find the right copy writer. It takes time, effort, research, and sweat to create ads that “stick” and ads that work. It’s NOT easy to get past what you think a radio ad should say in it…and what it should sound like. The best radio ads take tradition and crush it. The best radio ads talk to the listener about what the listener would like to hear…not what the business owner usually wants to hear. Which makes sense, right? Aren’t we trying to engage the listener (your prospect)? 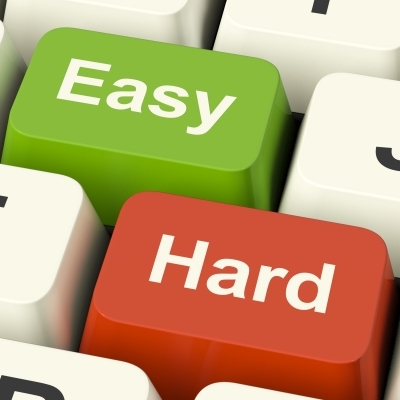 Get past “easy”…and move towards “effective”. It won’t take long before the right way IS the easy way. Let me know when you’re ready to take the bull by the horns. For more help with local advertising performance, and advice concerning what you should actually SAY in your ads to make them work better, consider my local advertising book, “Take a Bigger Slice”. Or click HERE to read a bit more about it. Have a great day!